Scripts have been updated, based on information in the comments section. REM * instances (if any), along with a listing of the installed features. REM * filepaths for SQL 2008 R2, SQL 2008, and SQL 2005. 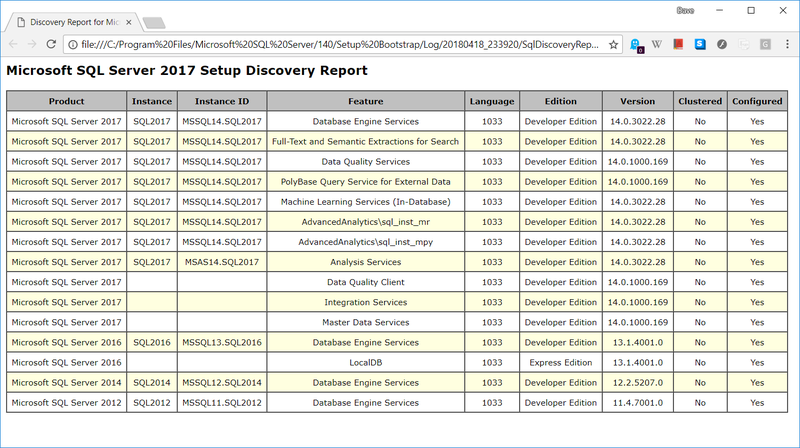 REM TODO: Does the Discovery Report run the same way for SQL Server 6.5, 7, and 2000? ECHO No SQL Server instances found. 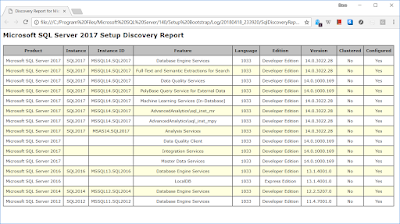 Runs the SQL Server discovery report (opens in default browser). verified on SQL 2008R2 and SQL 2012. Further verification may be needed. this script should continue to work with no enhancements. lesser versions of SQL Server that are installed. Output a message if no installed SQL Server features are found. Enhancements for older versions of SQL Server (2008, 2005). SQL Server 2008 R2 and for providing paths for SQL Server 2008 and 2005. #Locate the "%PROGRAMFILES%\Microsoft SQL Server" folder. Iterate through the "Microsoft SQL Server" sub-folders. Sub-folder names that are numeric are added to List of type Int32. #Sort() the List, then Reverse() it so there is DESCENDING order. Find the Setup Bootstrap Setup.exe file in the "highest" sub-folder. Iterate through the list of sub-folders with names that match the pattern "SQL*"
Run the exe with the appropriate parameters to run the discovery report. Break out of the loops. Start-Process -FilePath $setupExe -ArgumentList "/Action=RunDiscovery"
to older versions that didn't use the current version/folder/naming convention. 2008: "%PROGRAMFILES%\Microsoft SQL Server\100\Setup Bootstrap\Release\Setup.exe"
2005: "%PROGRAMFILES%\Microsoft SQL Server\90\Setup Bootstrap\Setup.exe"
#TODO: add strings to the array for even older versions of SQL (gulp). 2008R2: "%PROGRAMFILES%\Microsoft SQL Server\100\Setup Bootstrap\SQLServer2008R2\Setup.exe"
dir "%PROGRAMFILES%\Microsoft SQL Server\setup.exe" /S | FINDSTR "Setup Bootstrap" | FINDSTR /V "Update Cache"
Let me know if you'd like me to spin up older VMs to get the paths for 2000, 7 or 6.5. I'm glad you liked it, Jessica. Thanks for dropping by!